Book of Ezekiel (לאקזחי: எசேக்கியேல்) is the seventh book of the Book of Eights, the Prophets (Neviim). With 1273 verses spread across 48 chapters, the Book of Ezekiel is one of the large books in the Hebrew Bible. In all the modern versions of Bible, which is based on the Greek canon, Ezekiel is placed after Lamentations which in turn is preceded by Jeremiah. According to Jewish and Christian tradition, its authorship is attributed to Prophet Ezekiel himself. The name Ezekiel apparently means “(someone who has been) strengthened by God”. We do not know if this was the prophet’s given name or a title which he acquired at a later date. Like how Siddhart became the Buddha (“Enlightened One”), Ezekiel would have become the ‘strengthened one’ after the Lord chose him to be his messenger. We see similar instances of given and earned names for famous saints from other cultures and literary traditions also. To cite another example, the famous Tamil Saiva saint Appar or Mānickavāsagar’s given name was the least known Marulneekkiyar. In Islam, prophet Dhul-Kifl (الكفل ذو) mentioned in the Qur’an (21: 85; 38: 48) is sometimes identified with the Jewish prophet Ezekiel (Hughes, 1885). The prophet is however well known in Islamic tradition outside the Qur’an. No other prophet in the Hebrew Bible seems to have had so many kinds and times of spiritual visions of ascent and transportations into both earthly and heavenly realms. Ezekiel 8: 3 He stretched out what looked like a hand and took me by the hair of my head. The Spirit lifted me up between earth and heaven and in visions of God he took me to Jerusalem, to the entrance to the north gate of the inner court, where the idol that provokes to jealousy stood. In many places in the Book of Ezekiel, we see the spirit of God lifting Ezekiel up to provide him the glimpses of the status of various things………..
Ezekiel 37:1 The hand of the LORD was upon me, and he brought me out by the Spirit of the LORD and set me in the middle of a valley; it was full of bones. Ezekiel 43:5 Then the Spirit lifted me up and brought me into the inner court, and the glory of the LORD filled the temple. Before I come to a detailed account of these visions, let us have a go at Ezekiel’s prophecies. Unlike Jesus who according to Christians came to this world to deliver the Gospels or ‘good news,’ prophets like Jeremiah and Ezekiel appear to have been selected to tell the bad news. That is, the news of impending destruction of the Israelite land due to famine, plagues and invasion by enemies. All these were engineered by their Lord Yehweh himself for not keeping up his covenant. The Book of Ezekiel however ends with the promise of Jewish revival with a new Temple. When we read the Book of Ezekiel, we come to know that all these three kinds of inflictions were being imposed in the land of Jerusalem. What once was projected as a promised land of honey and milk, was soon to become a land of plagues, famine and slaughter by enemies. All these had to happen only because the people of Israel violated the covenant with Yahweh and went to evil days. In this context, I would like to reproduce an interesting poem from Tamil Sangam Classic Kalithogai. have observed that which is evil. And he who remains and is besieged will die by the famine. Thus will I spend My wrath on them. And a third I will scatter to the winds and pursue with drawn sword. The Bible says it better to be slain with the sword than with hunger, for they will pine being hunger stricken (Lamentations 4:9). An acute death is better than a chronic death. When will this tragic period of hunger end? Yahweh promises a bright light at the end of the long tunnel of suffering. “And I will raise up unto them a plantation for renown, and they shall be no more consumed with famine in the land, neither bear the shame of the nations any more” (Ezekiel 34:29). And who are these enemies? In the battle of Ezekiel (38-39), the armies come primarily from the north and involve only a few nations of the earth (Ezekiel 38:615; 39:2). More about these enemies called Gog of Magog in the section below. Among beliefs common between all Semitic religions of Judaism, Christianity and Islam, the legend of prophecy of Gog and Magog is one. The stories appear in all their scriptures namely the Hebrew Bible, New Testament and the Qur’an (Hebrew: גּוֹג וּמָגוֹג‎‎ Gog u-Magog; Greek: Γὼγ καὶ Μαγώγ Gōg kai Magōg; Arabic: وَمَأْجُوج‎ يَأْجُوج Yaʾjūj wa-Maʾjūj:). Since all these references appear in these respective scriptures in a prophetic sense, the verses have been subjected to all possible kinds of research and interpretations to find out who they are and where they reside. In all the three religious traditions, Gog and Magog are presented as the ultimate enemies to be destroyed in the end. However, there is a problem in accepting the passage in Ezekiel as a prophecy of relevance to this day. These days of modern warfare, no one comes with horses, swords and shields to fight. This is like the anticipated coming of Kalki avatar in Hinduism. Descriptions in the Puranas indicate that he will appear on a horse with a sword in hand. The prophecy of Gog of Magog in Ezekiel will have to be considered and interpreted as a reference to something which happened during Biblical times itself. Moreover, in the Hebrew Bible, it is not Gog and Magog but Gog from Magog. The Jewish tradition, for reasons not known clearly, had either changed or reinterpreted Ezekiel's Gog from Magog into Gog and Magog - as God's ultimate enemies to be destroyed in the final battle. It is this reinterpreted version of Gog and Magog which is found in Christian and Muslim sacred texts. According to the Book of Revelation, Gog and Magog would appear from the nations in the four corners of earth to battle with Christians. Revelation (20:7-9) predicts that Gog and Magog will be let loose after 1000 years of imprisonment and from the Quran (18: 83-98) it is evident that Dhul Qurnain was responsible for this imprisonment (who does it at the behest of the local people). In other words they were still under confinement during the time of Muhamamad. Since more than 500 years have passed since the advent of Islam, we can assume that Gog and Magog have already been freed and let loose from captivity. Let us go back a couple of centuries ago (1881 to be precise), the day when Narendranath Dutta (the one who became Swami Vivekananada at the age of 30) met his soon-to-be Guru Sri Ramakrishna. 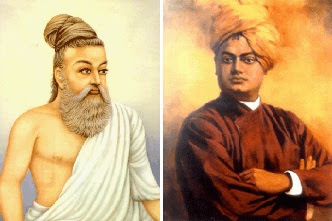 Being a staunch rationalist Vivekananda’s first question to Sri Ramakrishna was the customary question he normally asks all godmen he met: “Have you seen God?" and the reply from Sri Ramakrishna was instantaneous: “Yes, I have seen God. I see Him as I see you here, only more intensely!" Remember Jesus (see John 10:34) is said to have recollected the passage from Psalm “'I have said you are gods” (Psalm 82:6). The idea here seems to be that all humans are children of God. As said in Genesis (1:27), didn’t God create man in His own image? As said in the Quran, why did God ask Satan bow down before Adam, though a mere mortal (Quran 2:34)? The answer to all these questions perhaps lies in these verses, one from the New Testament and the other from Tirumandiram. “Don't you realize that your body is the temple of the Holy Spirit, who lives in you and was given to you by God? You do not belong to yourself, for God bought you with a high price. So you must honor God with your body.” (1 Corinthians 6:19-20). “I realized the body is the Lord's temple and so I began preserving it with care infinite” (உடம்புளே உத்தமன் கோயில்கொண் டான் என்று உடம்பினை யானிருந் தோம்புகின் றேனே) (Thirumandiram 725). With this background, let us now focus on Ezekiel’s vision. The word ‘Penial’ is the place where Jacob saw God face to face. Why is it said that his life was spared for this? Elsewhere in the Genesis itself we see that "you cannot see My face, for no one may see Me and live" (Exodus 33:20). Also in Judges 13:22 it is mentioned: "We are doomed to die!" he said to his wife. "We have seen God!" Is seeing or realizing God a death like experience? Why then this fear? Moses had this kind of unmediated relationship with God. But he, like all other mortals, never saw an actual "face" of God. He saw the clouds descending, fire in the bush but not God. It is possible to interpret Jacob’s experience as something that happened in a state of ecstasy or meditative state? What about Jacob’s dream of ladder on to the heavens? And many other verses in Ezekiel inform us that the Jewish Lord appeared in his vision in human form. And high above on the throne was a figure like that of a man. Like the appearance of glowing metal. ‘How can vision of god be like human form?’ one may ask. Didn’t we see in the first Book of the Bible, the Genesis, that God created the first man Adam in his own image? (Genesis 1:27). Since all our attempts to visualize divinity would be through our human senses, there is bound to be a distinction between the human perception of God and the real nature of Reality itself. In Hinduism, all the gods are depicted invariably in human form. So was the case in many other ancient civilizations across the world. It is only natural, we being humans, to visualize God in human form. Swami Vivekananda, the great Hindu saint on the late 19th century A.D., reiterated this human tendency during his lecture delivered on “Realization” on the 29th of October 1896. “Suppose a cow was philosophical and had religion, it would have a cow universe, and a cow solution of the problem, and it would not be possible that it should see our God. Suppose cats became philosophers, they would see a cat universe and have a cat solution of the problem of the universe, and a cat ruling it. So we see from this that our explanation of the universe is not the whole of the solution. Neither does our conception cover the whole of the universe.” (Source: The Complete Works of Swami Vivekananda/Volume 2/Jnana-Yoga/Realisation). Elsewhere, he also reiterated: “By our present constitution we are limited and bound to see God as man. If, for instance, the buffalo want to worship God, they will, in keeping with their own nature, see Him as a huge buffalo; If the fish wants to worship God, it will have to form an idea of Him as a big fish; And man has to think of Him as man.” (p. 55). So, we are discussing about two different things here. One is the vision of God the sages have experienced which is governed by one’s cultural conditioning, and the other is the realization of divinity in individuals and in that sense everyone is a god unto himself. Swami Vivekananda’s view of this human tendency to visualize God in human can be surmised by his own words: “God Himself is your image. ‘God created man after His own image.’ That is wrong. Man creates God after his own image. That is right” (p 24). Ezekiel goes on further to describe how this divine vision was. Yahweh appears in a chariot driven by four creatures. The throne chariot of God is one of the commonest modes of prophetic visions experienced by Jewish prophets. References to the Lord employing the chariot as a vehicle in the Bible occurs outside Ezekiel as well (see 2 Kings 6:17; Psalms 68:17 & 104: 3,4; Isaiah 66:15; Habbakuk 3:8; Zachariah 6:1-8; 1 Chronicles 28:18). So, chariot mysticism appears to have been a common mode of divine vision in the pre-Christian era. Throne mysticism, a phenomenon or phrase originally employed to mean Jewish mystical ascents to heavenly abodes, has now become a general phrase to denote the experiences of mystic’s attempts to spiritually ascend to reach higher planes of consciousness. It won’t be an exaggeration to say that the Jewish throne mysticism is centred (or say originated from) on the Ezekiel’s visions of seeing God in His chariot on the sky. Thus it is also called Chariot mysticism. The objective of the students of the chariot mysticism is to recreate Ezekiel’s or Elijah’s experiences of divine vision and ascend in the chariot to explore the heavens (Caravella, 1989). That soars in Samadhi high. With Ezekiel’s background as a priest in the Jerusalem temple, it is only natural for his visions to have been influenced by the cherubim above the ark of the temple. And when we see those numerous references on Yehweh appearing on chariot, we have to only believe that Ezekiel was also influenced with the knowledge of the Lord moving about on wheeled carriages amongst the clouds. As Karen Armstrong says in the History of God “The visions are not ends in themselves but means to an ineffable religious experience that exceeds normal concepts. They will be conditioned by the particular religious tradition of the mystic. A Jewish visionary will see visions of the seven heavens because his religious imagination is stocked with these particular symbols. Buddhists see various images of Buddhas and bodhisattvas; Christians visualise the Virgin Mary” (Armstrong, 1993). It won’t be off the mark to say that if the Jewish Lord appeared to His prophets in their vision as a rider of the Chariot, Lord Shiva appeared to the Nāyanmārs of Saiva Siddhanta as Natarāja in his cosmic dance. Chariot allegory is not something unique to Judaism but is found in many other religious traditions as well. I am not the first (and will not be the last as well) to point out the parallels we see in the use of Chariot as an allegory to teach subtle philosophical interrelationships in various religious traditions. These religious and philosophical traditions include Hinduism, Buddhism and Hellenism. There are some interesting and detailed scholarly write-ups on this on net (see Uebersax, 2007; Kutty, 2009; Paula Marvelly, 2011; Marlow, 1954). While the mystical chariot is used as a vehicle to ascend to various heavenly realms by Kabala mystics in Judaism, the employment of this allegory in other religious traditions is more philosophical in nature, with the chariot, charioteer and horses being compared figuratively to explain the relationship between soul, body, God or virtuous acts. As in the Judeo-Christian tradition, the Hindu gods are also known to use chariots to travel in the sky. Venkatanātha, a Sānskrit poet of the 14th century A.D., describes the skyscrapers of Dvārka this way: “The skyscrapers of the city were higher than the heaven; the air-chariots of the celestial gods were flying low, as it were, due to shame” (Yadavabhyudaya, Canto VI, Translator: H.V. Nagaraja Rao). 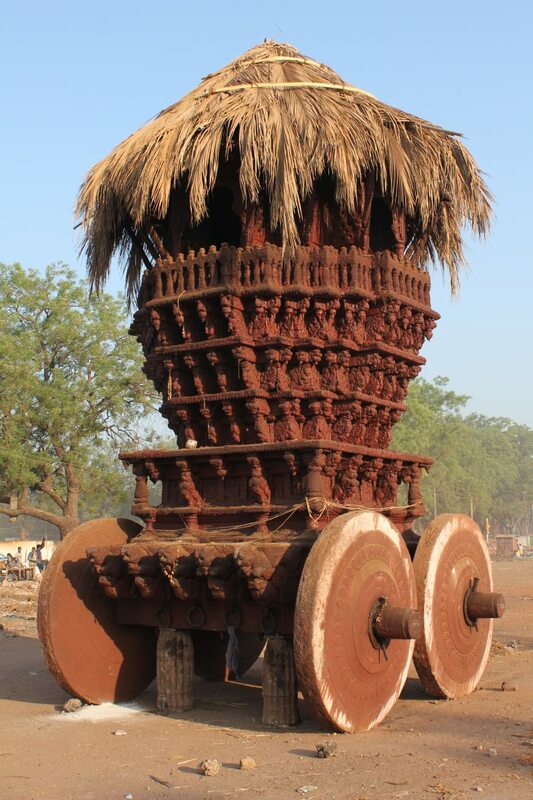 Not surprisingly, India has the tradition of employing temple cars or chariots for carry moorthy’s or representations of different Hindu deities. One of the main attractions in many annual temple festivals in Tamil Nadu is the procession of temple chariot. What was there as a vision is sacred texts, the Hindus have only put the same into practice. Coming to the Hindu scriptures, one of the important teachings of Yamadharma Raja in Kathopanishad is the parable of the driven chariot to explain his student Nachiketa the relationship between body, soul, mind, God and senses. Here the atman or the self is the passenger, body the chariot, consciousness the charioteer, mind the wheels, senses the horses and the sensual perceptions the chariot’s path. the intellect as the charioteer and the mind as the reins. and the paths they follow are the sense objects. when united with the body, mind and senses. like a wild horse that has not been trained. it behaves like a well disciplined horse. In Theravada Buddhism (Majjima Nikaya, 24, Tipitaka) also has a parable of chariot. Called the Ratha-vinita Sutta (Discourse of Relay Chariots), it describes the progression to nirvana in seven steps by employing the simile of seven different chariots for passing through seven different stages of mental purification called satta-visuddhi (** ) . In another verse in Samyutta Nikaya, the parable seems to have been used to depict the combined worth of 10 Buddhist perfections. In the Greek philosophical treaty Phaedrus, Socrates presents the winged charioteer as the intellect, one (good) horse as the rational or moral impulse, while the other (bad) horse as the irrational passion (Marvelly, 2011). The goal is to ascend to divine heights, but the black horse poses problems (Uebersax, 2007). Hellenism [Phaedrus, Plato, Penguin 60s, p.29]. In all these religious traditions, the chariot is used for the journey in life with a meaningful destination in mind, a destination of discovery or realization (of Divinity or Truth). Control of all the five senses is considered essential for any spiritual progress and the horse is the commonly employed simile to denote the senses that can go wild if not controlled by the rider. Buddhist classic Dhammapāda (94) states: “Even the gods esteem one whose senses are controlled as horses by the charioteer, one who is purged of all pride and freed from all corruption”. Tamil sage Thirumoolar says ‘the five steeds together entered’ (கூடுபுக்கானது ஐந்து குதிரையும்) (Tirumandiram 2893). Armstrong, K. 1993. History of God. Mandarin. Uebersax, John S. (2007). "Plato's Chariot Analogy". Online article. Retrieved from http://john-uebersax.com/plato/plato3.htm on mmm dd, yyyy. Marvelly, P. 2011. Allegory of the Charioteer and His Horses. Advaita Academy for the Knowledge of Yoga. N.V.K. ASHRAF. Picture Window theme. Powered by Blogger.